I grew up very spoiled - my mother always made us fresh tortillas from scratch. We stuffed them with veggies and soybeans and cheese and guacamole, and anything else you might fancy in your wrap (it's a hotly debated and highly personalized matter in my family!). To this day, it's still everyone's favourite meal. Even my husband requests it every time we visit my parents. I was so spoiled growing up that I only ever tried those rubbery, tasteless store bought tortillas after I moved out on my own.... and let me tell you, they are NOT the same thing! Rolling out your own tortillas is a lot less difficult than you might imagine, and it's definitely worth the effort every now and then when you have a little extra time to spare. In a small bowl mix water, sugar and yeast, and let stand for 5 minutes. In another bowl mix flour and salt. Add wet ingredients all at once into the flour, and mix with a wooden spoon. Then, using clean fingers, mix until incorporated into a ball and knead on the countertop for about 1 minute. Lightly oil the bottom of the bowl, and place dough back into the bowl. Cover with a damp cloth and let sit on the counter at room temperature for 30-60 minutes. Divide the dough into approximately 2-inch balls. On a well-floured surface, roll out each tortilla to 3-4 mm thickness. Add flour as necessary to avoid sticking. Place on dry heated frying pan (no oil), and cook tortilla for approximately 1 minute, until it starts to bubble up & rise, then flip over and cook the other side for another minute. 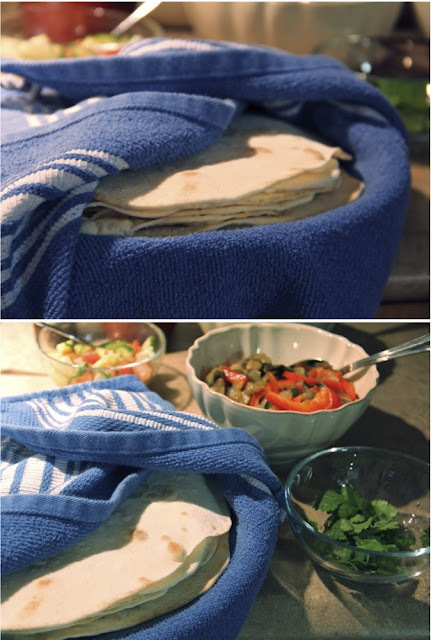 Place the cooked tortilla on a plate and cover with a damp tea towel, while rolling & frying up the rest. Enjoy with whatever fillings you desire! I've shied away from making my own tortillas since I don't have a press handy. You make it look so easy! I'm going to try this out and let you know how it goes. Have you ever made the corn ones? My husband started making his own and there is no way we can go back to store bought. nothing compares! yum- sounds easy enough- and fun to make. Thanks for the inspiration. I had no idea these were so easy to make! We go thru alot of tortilla's in our house..would be nice to make our own. What if you don't have a flat pan like in your photo..would a frying pan work?? Oh my gosh, I need to make these! Being from San Antonio, Texas, I *love* freshly made tortillas! Thanks for sharing! I'm absolutely trying this! Seriously - that looks amazing!!! Will have to try it. But is there a trick to dry-heating the frying pan? Any old frying pan works great. And there are no special tricks to dry heating the pan, just put it on the burner (medium high) and let it heat up a minute before placing your first tortilla. 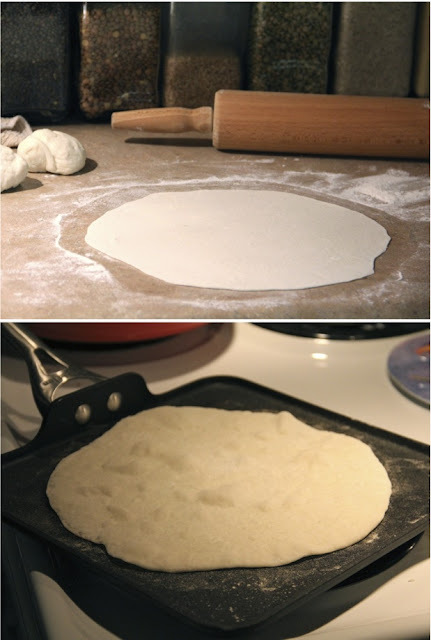 You can scrape off excess flour that builds up on the pan in between tortillas to help avoid burning them. I haven't rolled in ages... little ones keeping me busy. NOW they're all big enough to help! No fat. Interesting. Do they stay soft for long, or do they dry out faster than ones made with lard?